Give your curious cat the freedom to roam with the Cat Mate’s Lockable Cat Flap. 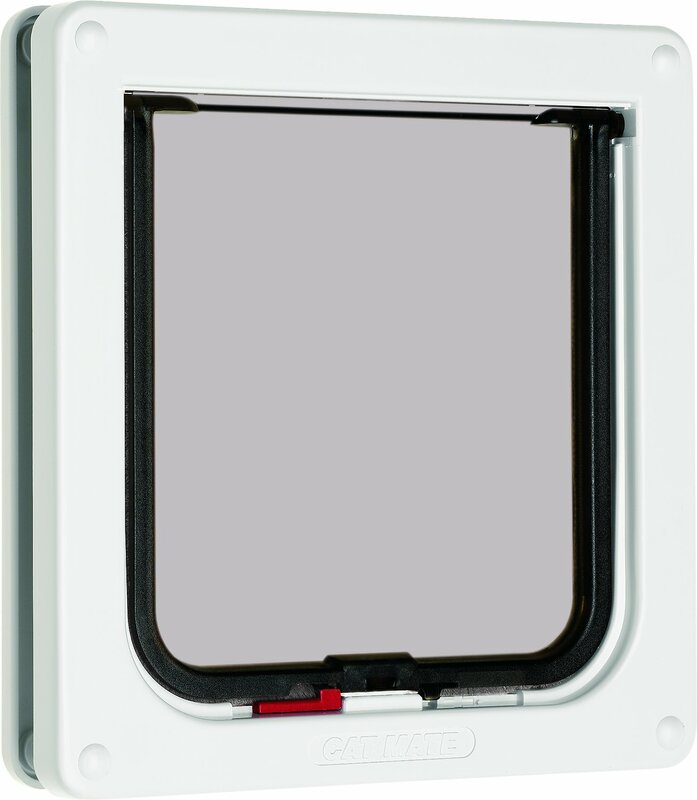 Made with uncompromised quality, this cat flap is designed with an easy-to-use slide lock and is paw-fect for thin panel doors and screens. The transparent material is made from durable polymer and allows your cat to peak through. It’s designed with a tamper-proof two-way lock for safety and security and has a draft and weatherproof brush sealed flap with a magnetic closure to protect against wind and rain. The 2-way locking cat flap offers peace of mind and security. Designed with a silent feature, so it doesn't scare your pet or disturb you. A built-in brush strip and magnetic closure help protect your home from the elements. The transparent flap is made from tough polymer and gives your kitty visibility. Available in two colors so you can find the right fit for your home. 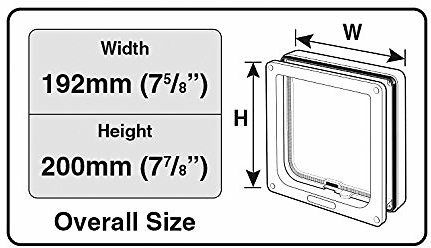 This cat flap is particularly recommended for thin panel doors and screens to 0.5 inches thick. Get Cat Mate’s Wall Liner for easy wall installation. Use an electric jig-saw to cut along inside of drawn line. For screen doors, use scissors or a sharp knife to cut hole. Be careful to cut hole square to the door, particularly with thicker doors. Ensure frames are free-fitting in hole. Position interior frame (frame without swinging flap) on inside of door and mark four screw positions. Remove frame and drill screw clearance holes in panel to approximately 3 ⁄16 inches diameter. Determine thickness of door panel (t). Position exterior frame on outside of door. Screw interior frame to it by using appropriate screw/spacer combination for panel thickness (see Fig. 6). Finally, fit screw caps. Good value, solid construction. Had a template for cutting hole and drilling holes, but typical of this type of installation holes never quite line up properly due to slight misalignment or imprecision in layout. Drill them slightly oversized and this will give you a little adjustment room. Installed this in our overhead garage door. I did have to go to my local hardware store and buy screws that were 1/2" longer than the ones provided, but it was worth it. It looks great, and works great! My wife taught our outside cat how to use it in 10 minutes and he comes in and out all the time now. This door does what it promised. I also like the fact that it doesn't swing back and forth without a little pressure. It means it's closed tighter and not flimsy. Patience says, "Thank You. Now I can go outdoors and back inside at my leisure. Mom and Dad are happy too because my door is thin enough that they can open the screen door all the way." Hard to install and cats won't use it. It seems sturdily made, but it was very hard to install. The instructions said to cut within the lines of the template, but it was necessary to cut outside the lines. Moreover, the screw holes on the two halves didn't line up well, so I spent a long time getting all the screws to go through properly. Finally, my two cats won't use it, even though I've forced them through a couple of times. They seem to enjoy looking through it as a window though. Or maybe a mirror. This cat flap works perfectly. I installed it in a window screen in less than 5 minutes. It took my 11 month old kittens about 3 days to really figure it out, but they're both pros now. It's so nice to not get woken up at 6 a.m. when they want in our out of the apartment. This cat door was easy to install and our cat took to it right away after showing her how to use it by putting her up to it and opening it just a couple inches. She smelled the fresh air and went right through. I like the lockable feature too for when we're gone and wish to keep her inside. The order arrived really quickly as well. I need it to use between the house and catio and it is going to work perfect. Very good product for the price. Easy to install. Love the brush around the door for muting noise.